These little fellas can be real pests at times but don't underestimate their abilities to reduce the bug population. Sparrows of many different kinds so abound throughout the US that it is not uncommon for three or four different species to frequent the same area. All basically "little brown birds" many are comfortable around humans and are enthusiastic visitors to backyards. They all share the distinctive finch-like thick, short, conical beak, so useful in cracking open seeds from plants on or near the ground. Sparrows usually are seen in flocks unless they are nesting. While they seem to all look alike, close observation of their head and breast markings, tail length and shape reveals that each sparrow species has its distinctive markings. Females tend to resemble males and their young tend to be paler or duller than the parents. Although they are regarded generally as "songbirds", most sparrows do not have trademark lilting calls. Song sparrows are found throughout the United States and do not migrate. They are between 5½ to 7 inches long, being larger and darker in humid Alaska and smaller and lighter colored in the dry Southwest. Their heads are brown with a narrow gray stripe. Another pale gray stripe runs across the top of their eyes. Their breasts have dark streaks that converge as a dark blotch of color under their chins. Song sparrows pump their long, slightly rounded tails as they fly. Song sparrows prefer thickets, brush, marshes, roadsides and gardens. They mainly eat seeds all winter, then add insects to their diet in summer. These sparrows get their names from the male's ringing introductory sweet, sweet, sweet call followed by a trill and a song that varies considerably from region to region. Chipping sparrows are common over a large portion of the US, and are especially comfortable around populated areas in the East. They do not migrate. Best recognized by their rusty red caps, black bills and white lines over their eyes, these sparrows are a little over five inches long. They have unmarked gray breasts and deeply forked tails. In the winter these markings are much duller. Chipping sparrows frequent open woods, orchards, farms and residential yards in towns. They eat insects during the spring and summer, turning to grass and weeds in the winter. While they are not inclined to visit feeders, they forage underneath them occasionally when natural food is scarce. Their call is unmelodic—an insect-like staccato of thin, short notes or chips. House sparrows are literally everywhere. 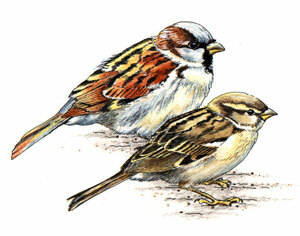 Originally called the English sparrow, they were introduced in Brooklyn in 1850 to control garden insects. Because they do not migrate, eat just about anything and nest almost anywhere, they have adapted to all kinds of climates and environments. They are completely at ease around humans, so they like cities, suburban neighborhoods, parks and farms. In fact, farmers sometimes regard them as pests, which threaten crops, and by homeowners as nuisances, which cause commotions at feeders and monopolize birdhouses. House sparrows forage for seeds year round. They feed insects to their babies in the summer. House sparrows are 5½ to 6¼ inches long. Males have gray heads with chestnut necks, black bibs on their chests and black bills. Females and youngsters have stripes on their backs, a pale stripe at their eyes and plain breasts. In some areas they compete fiercely with starlings, purple martins or bluebirds for housing accommodations. Their song is a basic musical cheep, cheep, cheep.